I don’t usually post things from new book issues… but the GUP newsletter that came today sparked my interest. Setting aside the early period, which I’ll leave in the hands of much more competent historians of ASL like Mary Beth Kitzel, what struck me was the reference to early 20th century ASL films, and the comment that “the sign masters [who I have to assume means people like Veditz and others] signed differently depending on their age”. I’ve not had a chance to look at the book, but this comment chimes with something that I found in comparing the attitudes towards sign, and towards Deafhood (if you can call it that in the early C19th) of people like Massieu, Clerc and Berthier in Paris. Particularly in the early days of the establishment of something, the generational effect appears to be enormous, and there is a clear difference in the way that those characters understood the value of natural sign, their place within a signing community, and their place vis a vis the hearing world. Suppalla and Clark’s approach to diversity in signing appears, at first glance, to be linguistic – they talk of the “word [sic] formation processes of early ASL”, but my work and work by others like Claire Shaw points to a very clear link between sign form, place and aspiration… essentially, what we’re seeing is signs developing as those who create them are caught up in different ways by the flows that carry them into and out of deeper or more marginal positions within a Deaf/hearing space landscape… I will read this book hungrily to find out whether they have also paid attention to the spaces in which those processes occurred. Given that I’m currently working on a project to look at the place of Deaf people in the 19th century Anglican church, my interest in this book should be obvious. I’m particularly interested to see what Morse makes of the exchanges that surrounded the emergence of St Ann’s church in the 1850s (although this does seem to fall between chapters 1 and 2). By Chapter three, my guess is that the book will have moved away from possible parallels with the British situation… but therein lies fascination. To my knowledge, there is no other significant research on the role that the American church has played in the history of the Deaf community there… so it will be fascinating to read. One thing I do wonder, though, is where the presence of Deaf liberation theology might fit. 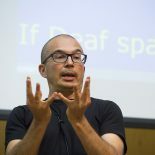 The summary ends up with the question of “technological innovations that might supplant religious rhetoric as a tool to support the Deaf community”. The notion that the Deaf community need ‘support’ by the church is one that has been cast aside by people like Hannah Lewis who pursue a theology of liberation that challenges the non-Deaf mainstream to take seriously the need to reform mainstream traditional church practices that exclude, and oppress Deaf people. This too… is rhetoric not OR the preservation of sign language… but AND the preservation of sign language. If this is missing from the book, then I fear Morse may have stumbled into a catch 22… by attempting to expose the rhetoric around sign language in a way that liberates Deaf people, without actually moving away from the wider discourses that Deaf people are those in need of ‘support’. This entry was posted on December 19, 2014 by Mike Gulliver in Musings.